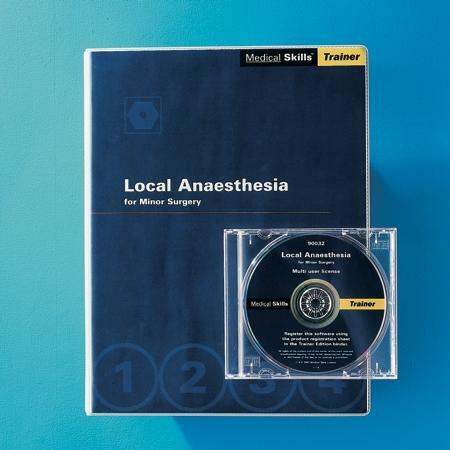 A suite of training materials featuring a CD-ROM with both Trainer and Trainee programs, supporting notes for the teacher, and printable handouts for the trainees. It is supplied in an A4 ring binder for ease of use and storage, and is available with a single or multi user software license. Trainer editions save the trainer from preparing presentation slides and handouts, and compiling video sequences. The multimedia software allows great flexibility for the experienced teacher, while providing a structure for less experienced teachers. It also eliminates the need for using a variety of presentation equipment during the session. The trainer can easily navigate back and forth through the Trainer program, affording excellent teaching possibilities from one-to-one coaching through to large groups with the use of a data projector. -Overview: Information on the Medical Skills training system, training support materials, program installation, using the Trainer and Trainee programs. -Reference text: All the explanatory text from the Trainee program. This gives convenient access to information on the relevant instruments, techniques and procedures to assist in course and lecture preparation. -Trainee Handouts: Copies of the trainee reference sheets. Each sheet covers a major subject topic with a checklist of the important points and problems encountered, supplemented by key images. -The sheets can be printed out from the PDF files supplied on the program CD-ROM. Academic centers, hospitals or practices that have multiple computers, can install the programs onto their server and/or onto selected PCs. This makes it possible for any number of users to use either program as and when required. The multi user license is particularly useful for a multimedia skills lab. For training sessions where the teacher has been using the Trainer program, trainees can reinforce and master skills in their own time and at their own pace under the direction of the Trainee program, potentially allowing lecturer contact time to be reduced. Both the Trainer and Trainee programs can be installed onto an unlimited number of computers providing they are within one site/campus. A new multi user Trainer Edition must be bought for each different geographic location.